40mm Toy Soldiers on Mars? What more could one ask? and check out this new blog by Kevin. So much for my winter campaigning! Its not very often that I've gone so long between posts but while this winter has not been record breaking, it has been one of the three or so most severe Februarys in the 35 years since I moved to Nova Scotia. Its been a bit like being back in Quebec! Its certainly been enough to disrupt my gaming and painting. I did get in a solo medieval/fantasy game for my Gathering of Hosts blog but since then what time and energy I have had for my hobby has been sucked into working on the Gathering of Hosts rules including a now abandoned attempt to harmonize it with the Square Brigadier. However, nothing lasts forever and plans are afoot for next week. The last test game left me thirsting to play again but something smaller on different terrain with both sides on the move. All this snow shovelling has left me a bit tired and has eaten into my spare time so I wanted something to amuse me during breaks as well as testing the rules. Luckily this sort of tape and modular terrain lends itself to tampering and in no time at all I had a cross road in the midst of fairly open, rolling terrain. The armies approach. Red's cavalry has seized the town but supports are far behind while Blue is up and deployed. Turning back the fictional clock again I broke out the reds and blues of an earlier day and set the game in the long disputed Origawn Territory, somewhat more settled now than when the original fighting took place in the 1850's (see Blast Off Ridge) but still disputed and thus not as heavily settled as it might be. Borrowing from Grant's Sawmill Village I gave each side a General plus their pick of 6 "units" with . a "unit" being 1 battery, 1 Squadron of Cavalry or 2 companies of infantry. A random choice could have been made but I wanted each side to have all three arms for play test purposes and I didn't want to borrow 1850's or 1905 figures. Blue has ample infantry and gun crews but only 1 gun and 1 cavalry squadron while Red has ample cavalry and gunners but only mountain guns and 6 companies of infantry including one slight cheat. So there I was: 2 cavalry, 1 mountain howitzer and 6 infantry vs 1 cavalry, 1 field gun and 8 infantry. The cavalry were all regular shock troops with carbines, the infantry regulars with modern rifle and bayonets. The army morale was arbitrarily set at 4 for each side with uncontested control of the town being worth 1. (In others words a side had to retreat if it lost a combination of 4 units and leaders or 3 units and leaders if the other side held the town). A pincer attack by Blue aims to delay Red's reserves while the Blue Guards close in on the White House. There were 2 main things that I wanted to test. One was the current variation on the Orders system and the other was the reversion to 1/2 casualties with the old Rally rule. In particular I was curious about what range of commander to unit ratios would work. In the previous game there had been between 4 and 6 units per commander and it was about right given the dispersion that happened during the attack. In this case I was set to have 9 or 10 units with 1 commander. If individual orders were always needed then it was clearly inadequate but on the other hand each commander is capable of moving up to 27 units on a roll of 1 if they were properly formed with several units stacked in columns in a hopeless "+" battle formation or 10 or 12 units in a more reasonable but still tight formation. Once units get driven back, charge ahead, make a flanking move or need to rally, it gets trickier. This variation is how the rules had originally been envisaged and I am glad to be back to it but doubts lingered. I had toyed with regimental commanders for groups of 4 companies. These could only command adjacent units but in practice not only were they everywhere and plentiful enough to often risk themselves to bolster troops in combat but having mounted officers leading charges seemed too romantic for even toy late 19thC soldiers and having them on foot meant they kept getting confused with company officers. If starting from scratch with the Colonels as the only officers it might have worked but I'm not cashiering all the existing Captains and replacing them with sergeants. That horse has bolted and is long gone. As it turns out the old formula worked like a charm. 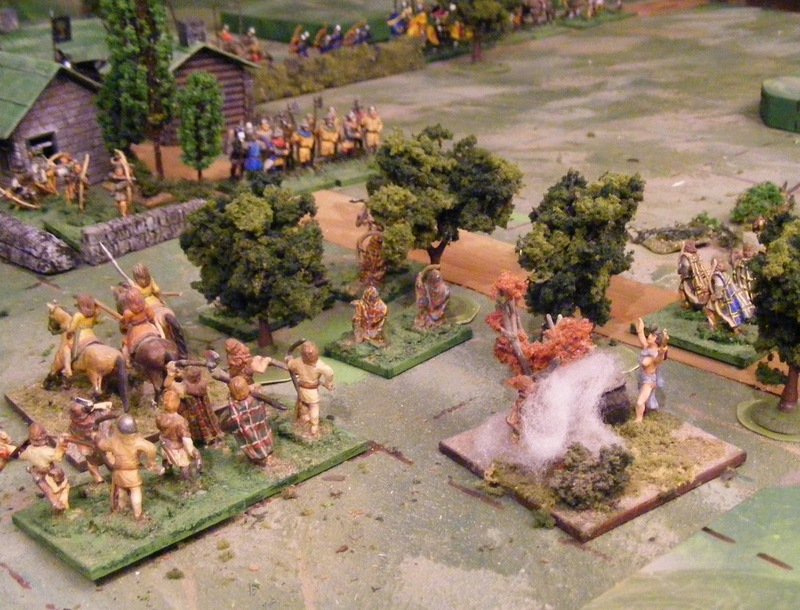 Usually the Brigadiers were able to do what needed doing but several times there were not enough pips on the die and choices had to be made, press ahead with the attack, or regroup or let engaged units engage in a firefight while the general tries to rally troops for a new attack. I think the new rule of thumb will be just 1 Brigadier for "armies" of up to 12 units. For larger forces, 1 Division General and up to 1 Brigadier per 6 units. The Blue Guards have stormed the White House, capturing or killing all of the defending lancers but find them selves in a firefight with some redcoats in the Warehouse. An attempt to capture the other white house has just been repulsed while the Blue Dragoons ran afoul of the Naval Brigade with their howitzer backed by rifle fire and have been driven back with loss. In the end I was glad that I stuck to my guns as everything worked as envisaged. The 1/2 casualties with defined rounding worked just right. Being in full cover makes it hard to wear a unit down. A unit in partial cover or extended and prone is as easy to hit as a formed unit but the maximum damage is limited to the same as troops in cover. With no variation in scores or number of dice, its all easy to track. Perhaps I should not have been surprised that it all worked since all the individual rules had been tested at various times, and the ensemble was a small variation of the tried and tested rules used from 2013 through the first half of 2014. Still one never knows till one tries. The Blue Guards have been repulsed all along the line and Red is advancing to consolidate their hold on the town. Blue's General has run low on ideas and falls back on a long range firefight while he tries to rally his Brigade for another assault. So, how did it go? Two thumbs up! It would have made a good report for the Newport Noodle but I wanted to talk a bit about the rules so maybe next time. Here is the short version. Red won the toss and got 1st move. He rushed his cavalry ahead full steam trusting that he would roll high enough on the next turn to both seize the town and bring up supports. He didn't. That left Blue having to choose between sending his cavalry ahead 1 vs 2 to try and drive the Red cavalry back before they could dismount and occupy the buildings or keep his force together for a concentrated attack. I decided to roll with a 5,6 indicating a rash attack but a 2 was rolled and so I applied a more cautious approach. 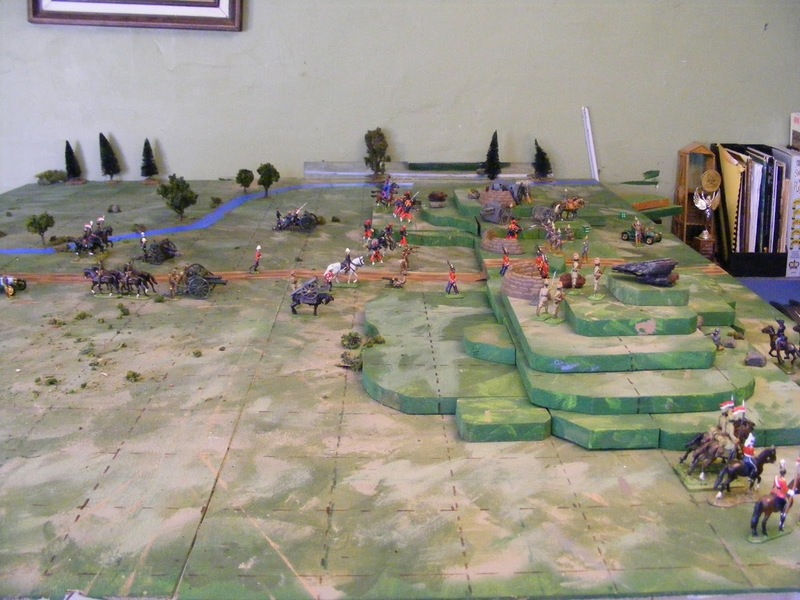 From there the game proceeded as per the photos with Blue's concentrated attack, supported with artillery while the Blue Dragoons threatened the flank, succeeding in taking 1/4 of the town before being repulsed. An extended firefight ensued with Red eventually launching a limited counter attack taking a 3rd quarter and driving Blue back then breaking their morale (3 units destroyed plus Red had the town but most of Blue's units were down to 1 or 2 figures). All in 12 turns played over perhaps an hour or a bit more over 4 or 5 short sessions. There were turns of fortune, choices to be made, a clear result and I got to use my new dismounted dragoon. Perfect. End Game. Heavy fire from Red breaks up every attempt at another Blue assault and eventually they are forced to give up and retire. At some point I'll see just how big a battle the rules can handle without me getting bored but this is the sort of small scenario I anticipate using for most impromptu games. Back to figures and terrain and background narrative. The armies are already about 1/2 of their full strength but I also want to get back to doing field hospitals, signallers, engineers, marching bands, civilians, staff officers and the like, maybe 100 or so more figures plus a couple of guns, limbers and carts as well as tidying up the varied basing. Once spring comes around and I can access my table saw, I need to work on the hills to make them more flexible. I also want to build new houses and some farms to fit the grid. Ideally a house should take up 1/2 a square and be able to hold a unit rather than being solid. Also lots of hedges. I'm still having fun with this! OK I admit it, I've been letting myself get distracted, playing at Sapper and so on. But I have managed a few minutes at my workdesk now and again. The Blue Dragoonsand the new Hougal Light Horse each now have a dismounted marker figure. More importantly, I now have an affordable, easily made, kluged prototype of a late 19thC artillery piece. When I look about for a 40mm fieldgun for late 19thC Colonial wargames, there isn't one really. STS and Irregular have various toyish guns, none looking even remotely like a 12pdr rifled breechloader and all too expensive for my budget, esp with exchange and shipping, for something that's not what I'm looking for.. The Sash & Saber 10lb Parrott is not right but close enough and an attractive little model to boot but again beyond my budget at the moment and perhaps a little too serious looking for this project. 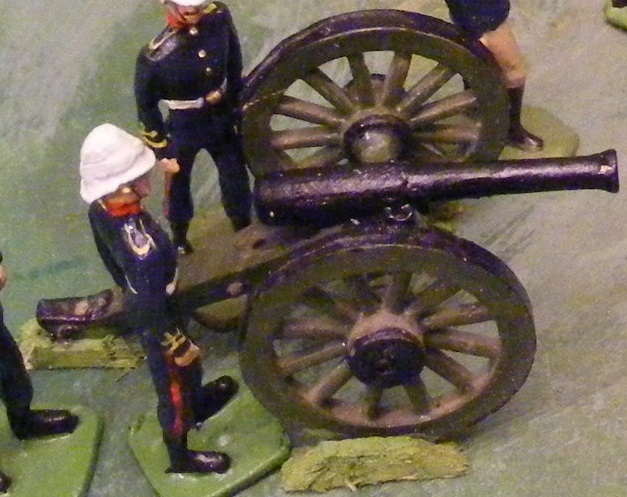 The ACW canon that Historifigs sells is a nice, simple OS 12pdr Napoleon. Its a little small, esp for figures on a base, and the wheel rims are a bit thick but it suits the figures well. Its just that its a bronze smoothbore muzzle loader and it looks it. So, after some pondering of options, such as whittling a new longer barrel out of wooden dowelling, and looking at pictures of various rifled breech loaders of the last quarter of the 19thC, I cut off the trunnions of a Historifigs gun then took some epoxy putty and built up the breech, incorporating the cascabel, thus lengthening the overall length of the barrel and giving the rear 1/3 that typical swollen look due to the need to reinforce the breech. Not great, not accurate but I think it gives the right impression and should be quite a serviceable toy hun. To lessen the height deficit vs figures on bases I added wooden blocks under the wheels and trail with "grass" to lessen the oddity of a gun floating on blocks. Now to order 3 more guns, and some crew in slouchhats for various purposes. Well, that's the week done and not much worth writing about. Not even a proper game to report on although I did finish Sir Arthur Conan Doyle's The Great Boer War, (Available as a free ebook, all 462 pages, no maps or prints) 2 thumbs up, 5 stars, maybe I'll even write a book report later. The game in 30 seconds: Red's cavalry flanked the hill on the right but were blocked, a frontal assault by 3 waves of Red infantry supported by guns eventually broke the enemy center. Heavy casualties on both sides but numbers won. I did play that game shown in the last post, but not the way I intended. Instead I played a turn or 3 at a time over 4 days, possibly in excess of 20 turns and a total of around 3 hours, mostly while dead tired and with frequent rule changes to test various options. Enjoyable and periodically engaging but not what I had planned, Apart from the discontinuity, the scenario itself was flawed. Well, not the scenario but the execution of the idea. The idea was that Faraway or Red forces were marching in pursuit of Oberhilse or Blue and found them dug in atop a ridge barring the road ahead. Red had close to a 2:1 advantage in numbers but was not "all up" while Blue was entrenched with difficult ground on the flanks and their positions were concealed. That latter point proved to be an error since I used my usual card system but here it failed me, The key positions on the ridge were nearly all unoccupied while much of the infantry was massed in reserve on the far right. One might presume that Blue was the one surprised but it did weaken their defence. It would have been better if I had garrisoned the key points and used the cards to place a variable and unknown number of reserves. The second issue is that I deployed the hill too close to the edge. When Red sent their cavalry around, to flank it, they found a narrow causeway between the rocky hill and a huge chasm. Oops! OK if I had intended that but I meant to allow for a flanking attack. At least the game not only provided some much needed distraction if only for a 1/2 or 1/4 hour at a time but it also allowed my to try and reject various rules options. The draft is now up to date and I plan to rearrange the table and play a meeting engagement sometime this weekend, hopefully in no more than 2 or at most 3 sessions. Today's snow storm has been cancelled. Yay! 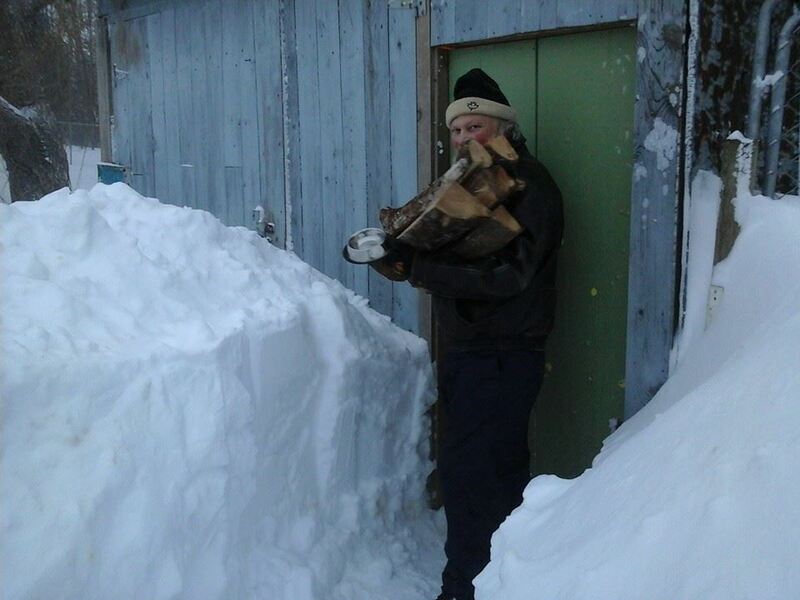 I know, I know, there are parts of the world where 130cm in 8 days and prolonged temperatures in the minus 20's Celsius (when windchill is factored in) are routine, but not here, That's about twice as much snow shovelling and twice as cold as usual and its been interfering with my HOBBY DAMmit! Well, getting tired more easily has something to do with it. However, too tired to game or paint is not the same as too tired to revisit past blog posts on rules and games or too tired to muck with rules, but it is just a bit like designing while drunk so revisions have been flying like crazy as I type them then erase. Still, I think I have re-identified the key underlying factors in the handful of issues that have been causing me grief with the Square/Tin Brigadier for early 20th C rules. A column of Faraway troops approaches a pass held by an Oberhilse force of unknown strength, cleverly hiding underneath face dpwn playing cards. The problem that set me off in August was how to handle infantry in extended order using fire and movement from cover to cover to attack the enemy. There are, very broadly, two main ways to approach this, one is to try to show explicitly they are less vulnerable to fire than denser masses but more likely to stall under fire and less able to apply concentrated force, the other is to say that this is below the radar for the General/player and is assumed to be happening and not worry about it as long as the over all result feels right. That second approach is consistent with the general philosophy behind the Square Brigadier, the first isn't really but I have been trying to square the two. All the other issues stem from this decision as the Square Brigadier was doing a satisfactory job when I started. Of course while searching for a solution I went down enough roads to lose the sense of what was important and got sidelined by other aspects. The version that I am about to test is not precisely the same as the August version but its philosophy is very close and it is just an improved version, hopefully. One option I played with this weekend was to revert to something very close to the combat aspects of Richard Borg's Memoir, complete with "flags" (ie retreats based on a specific number showing on a die) but the more I thought about all that is good with that system, the more I thought about a couple of little things that I'm not so happy with and more importantly, the more it seemed like copyright infringement. Since there were other options I decided not to go back down that path. One issue that has been giving me issues is that in order to make the 1/2 casualty thing work, I needed units to roll at least 2 dice or to be able to concentrate fire and it limited the number and type of modifiers while leaving too high a risk of excessive casualties in ordinary situations or else too few leading to a game that dragged. Looking back I remembered that I have several times fallen back on fewer dice but modifying the score to hit. This approach means sometimes cover doesn't help at all but because even a single die can have an effect, the over all number of possible hits can be contained. In fact is was what I had resorted to for the Square Brigadier and it had been satisfactory with the element of risk just big enough to never let a player relax just because he thinks he has a good position. One of the other main things that I have tinkered with over the last 6 months is the approach to Command Control varying between an activation system or an initiative roll and command radius. Again, they each have something in their favour but it occurred to me that if it were a bit harder to control extended infantry units, the result would not be that different from getting pinned and rallying, over and over again, especially if I reintroduced the "move OR shoot" rule. By shrinking the command radius of subordinates back down to "adjacent" and reverting to a single die, knowing that will almost never be enough to move everyone, I am back to where I was in August and happy, If I get too many troops on the table, I'll re-introduce another layer of command. So its all looking good and Faraway is set to attack a pass defended by Oberhilse. Maybe tomorrow, maybe Wednesday but its coming! Winter storm after winter storm have brought enough snow and freezing rain to interrupt the winter campaigning season while I shovel but haven't completely halted all hobby activity. I managed to do to 2 dismounted lancers which will give me a dismounted marker for each squadron. Also, I have rebased the Scruby Brigade for 1812. Just need to add a drummer for the Fencibles. I decided to paint the bases rather than rely on the usual dark green flocking. They match the green hills better than this sandy section but it will eventually green up again as well. 40mm Scrubies from Historifigs, with some original and some converted Zinnbrigade command figures. While I was waiting for glue to dry I ran through a few test rolls of an encounter between 2 opposing battalions and then 2 opposing brigades using the British victory at Crysler's Farm as a guide. It quickly became evident that with the Americans as Line Infantry vs British as Grenadiers still ends up as mutual annihilation unless the US rolls low. US firing as Militia vs British as line should normally leave enough Brits to face a second attack but only very poor rolling by the US would allow for the historical result. With both sides as line, Chippewa and Lundy's Lane are both possible with the dice determining if one side wins or both are blown to pieces. Essentially the low number of troops make it very chancy and will make for a very quick game. Luckily, now the troops are organized on shelf trays again, set up and take down is fairly quick and easy. It did get me thinking though and I have started the slow process of polishing Hearts of Tin as an alternate rule set using the same organization. The working draft is available again under blogs and rules at the right of the desk top version of the blog. 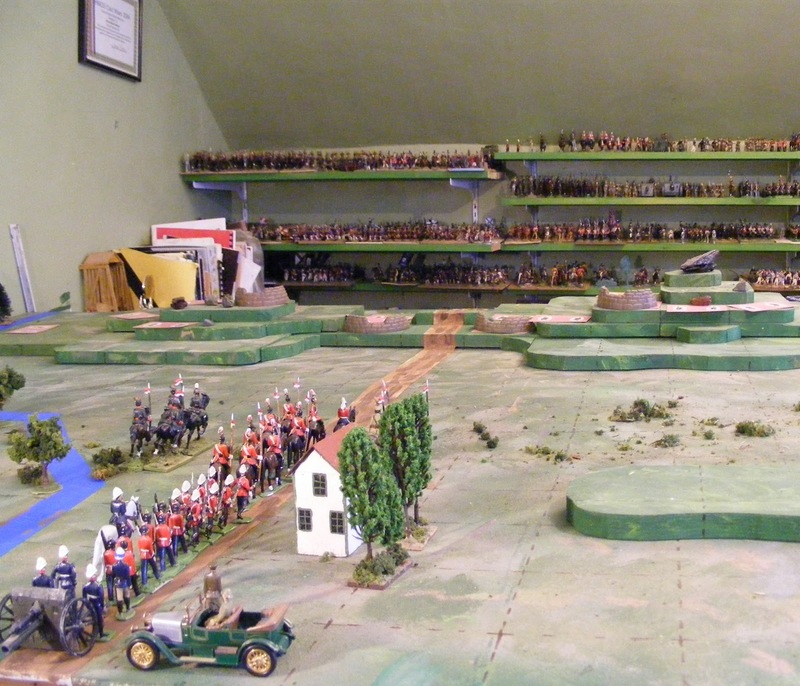 This is where I was in 2012/3 when I first looked at arranging the 1812 troops to use either rule set. The detour was useful mostly as a way to eliminate nagging doubts using trial by fire. Work has begun on planning a game for the 1900 chaps some time in the next week. Or in other words, I may have Scinde after all. I was rearranging figures on the shelves including the left over over British units from my aborted Scinde campaign and suddenly remembered that there is a good chance that Historifigs will start re-releasing some of the old 40mm Scruby colonial figures this year. With the War of 1812 almost caught up, the early 20th Century moving along smartly and a few feet of shelf space not fully accounted for, I might finally be able to get back to that long delayed Indian question later this year. Scruby 40mm Native cavalry from Richard Larsen's collection. To maintain compatibility with the 1812-1837 troops I will plan for Charge! units again, The troops I have are in shell jackets and Havelocks so I think they are close enough to serve as the start of an 1857 force for the Great Mutiny, which was really what I had wanted to do. Perhaps an imaginary Native state inspired by Gwalior rather than one of the main mutineer armies. 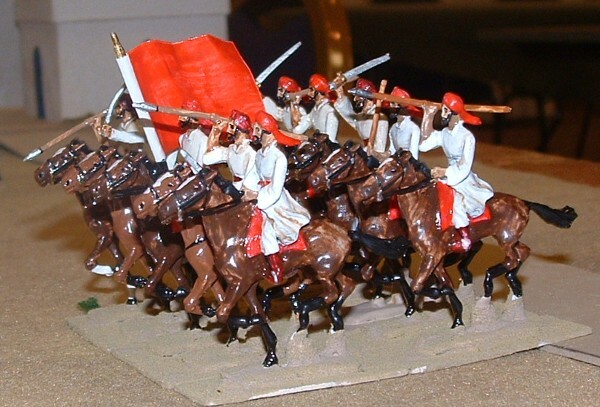 For the rebels, light cavalry, artillery, militia for native infantry, line infantry for sepoys. 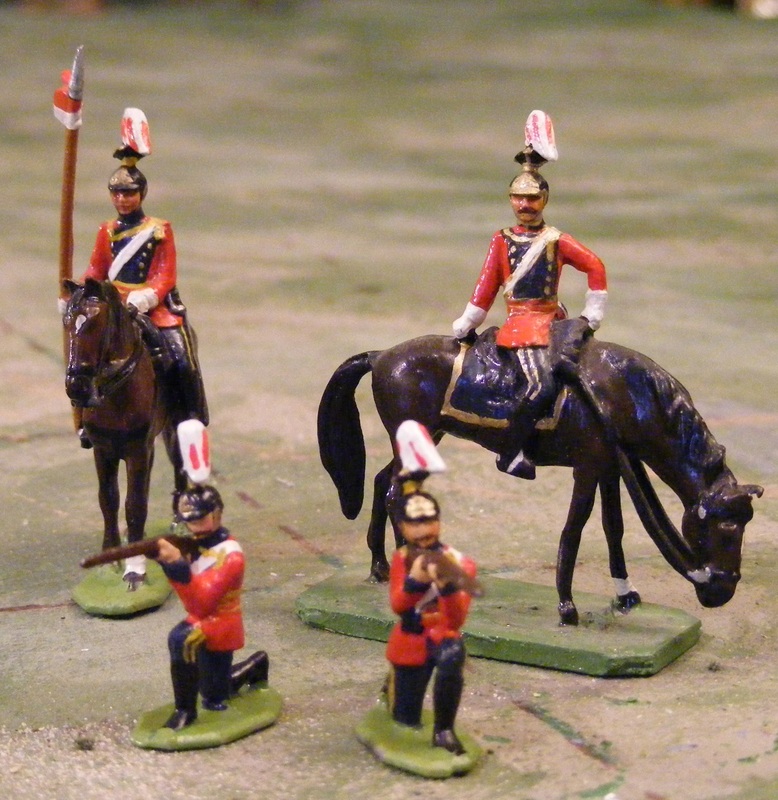 British cavalry as Heavies regardless of title, artillery, British line as Grenadiers, or maybe as line infantry if I want to field more of them. With the sort of odds they could face, I already have enough British to do for a while but afterwards there are a plethora of interesting uniforms to convert and paint. 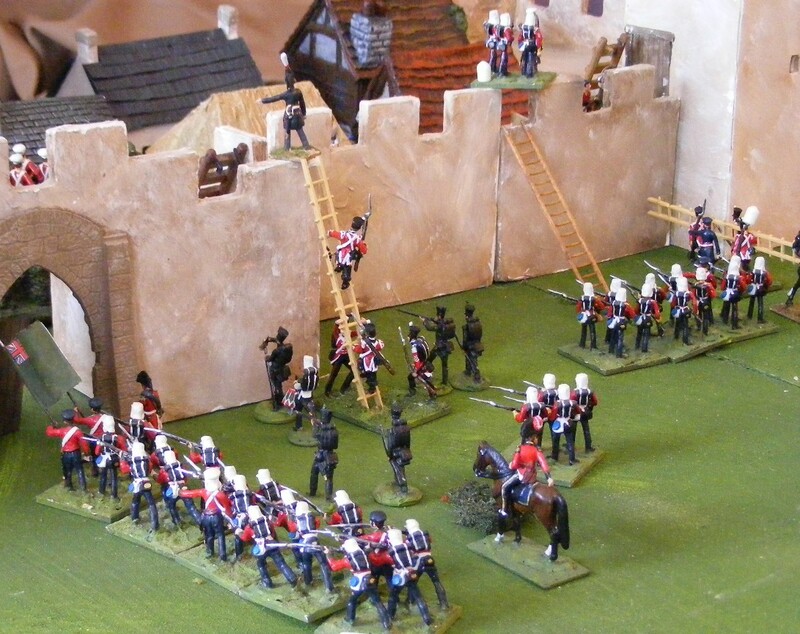 Converted 40mm Scruby, Zinnbrigade, Sash & Saber and original figures storming a fortress in 2009. I usually start by looking at scales but since the authors are dismissive of a too rigid adherence to them I didn't bother this time around, until today. I'll spare you most of the calculations but assuming around 25 men per figure giving a fairly reasonable average of 400 men per battalion and near 1" per figure, I get a scale of around 15 yds per inch (16.6something) which gives me a rather reasonable 200 yard long range for musket fire using Charge! and fits Crysler's Farm nicely onto my table, in fact it was the scale I had been using for MacDuff in my efforts to write a set to use instead of the classic Charge!. From the archives, the 40mm lads fighting Crysler's Farm c 2011.